NearTime’s Current attempts to solve a problem that programmers have been working on for decades: how to integrate applications—and different types of data—into one tool. But Current turns out to be a vexing solution to the challenge of organizing, linking, notating, and keeping track of a massive quantity of information. Current promises (and delivers, to some extent) a lot of functions that make people who collect and organize content drool. But users pay the price in interface complexity. Working with Current made me feel like I was trapped in an M.C. Escher print—unsure where to begin and often disoriented. That last point is important—and false. Near-Time is marketing this application as a consumer product, but in reality, the program is deceptively complex, and that is a major flaw. The program’s primary metaphors for organizing and viewing information—Store, Views, and Spaces—are baffling, and there’s no quick, familiar way to get started on a project. Moreover, I found the tutorial to be poorly written and confounding, the new metaphors and terminology confusing, and the interface perplexing. Current may be a powerful program, but I never got a chance to find that out. After two trips through the tutorial and in-depth tech support from Near-Time, I still had to abort three attempts to begin projects that involved gathering, viewing, and sorting information. My old way of working—using dedicated applications and switching between them when necessary—works a whole lot better. Current lets you link together lots of different kinds of files and feeds—but the interface and menu options can be daunting. Current’s individual tools are familiar: you can create pages using a simple text editor, subscribe to RSS feeds, browse the Web, archive Web pages, and import your own files to work on within Current. The tools for these tasks work reasonably well. 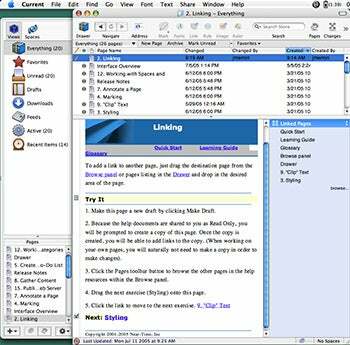 However, their functionality and ease of use falls far short of the applications I normally would use to do these things: Ranchero Software’s NetNewsWire Lite, Apple’s Safari, Microsoft Word, and, for archiving pages, Mozilla’s Firefox Scrapbook extension. But Current promises more: it says you can make links between any content that you’ve stored within Current, notate the content, and, if you’re a blogger, publish it. Linking and notating both work, but in an idiosyncratic fashion that often tested my patience. Current’s publishing and blogging tool delivered mixed results in my simple test. I was unable to post entries to a blog created at Blogger.com, and received cryptic error messages when I failed—but I succeeded in posting the same blog easily at Typespot. com. Finally, Near-Time Current is buggy. It froze my PowerBook G4 several times, leaving even the Force Quit command unavailable. While I was testing the application, the company updated Current several times, ridding it of some bugs. But its latest version still freezes my machine on occasion, something that rarely happens in OS X. 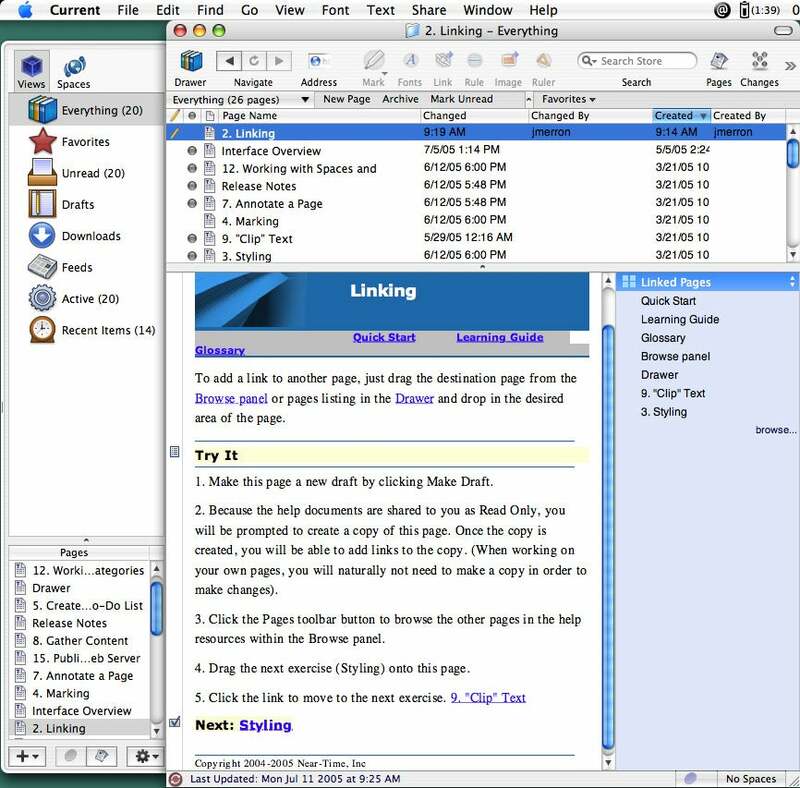 Current feels like a beta product, and free or less-expensive single applications such as NetNewsWire Lite, Safari, and the word processor of your choice do the job better. Current has potential, but I would recommend it only to early adopters who like to fool around with new ideas—and who have the patience for an unintuitive program. Thanks to the free 30-day trial, it won’t cost you anything but time. But if you need to get work done today, stick with your old standbys. EDITOR’S NOTE: 7/21/05 - A new screenshot replaced the previous version.